Canon's latest "G" series powerhouse, the G11 continues the tradition of this line by offering appealing, high-end features coupled with outstanding quality and performance. You want many of the controls and features offered by a dSLR model, packed into a more compact shell. Canon continues to add new models to their legendary "G" series line of powerful prosumer models. The new PowerShot G11 compliments the G10 we reviewed last year, offering some of the same features that we have come to love about these cameras. These include Canon's Digic 4 image processor, a versatile 5x optical zoom lens with true optical image stabilization, broader shutter speed range of 15 - 1/4000 sec., TTL 9-point AF system, RAW and JPEG image capture (RAW+JPEG is available), Face Detection AE/AF/FE/WB with blink detection, Motion Detection technology, an SD/SDHC memory slot, powerful NB-7L 1050 mAh Li-ion battery, and VGA or QVGA resolution video recording. There have been many changes made to the G11, like an all new 10-megapixel "high-sensitivity" image sensor, which is is physically the same size as the 14.7-megapixel imager found on the G10. This means that each photo site or pixel is larger, thus offering the possibility of performing better in low light conditions. Other new additions include a smaller, but more versatile, 2.8-inch vari-angle LCD (rotates up to 270 degrees), ISO 3200 is now accessible from the ISO dial (available ISO range is from 80-3200), HDMI audio/video output, a new Low Light mode with ISO capabilities of up to 12,800 at lower resolution, new AF-assist lamp, and an Intelligent Auto exposure mode. Canon also added their new "Dual Anti-Noise System", which they claim combines the high sensitivity capabilities of the new 10-megapixel sensor with DIGIC 4 noise processing, offering higher quality photos with less noise when using the upper ISO settings. The "G" series is designed for those who want the control and versatility that can be found on a dSLR model, packaged into a compact body, and do not want to fuss with changing or carrying around bulky lenses. While obviously geared more towards the photo enthusiast, the G11 is still quite tame, especially with the inclusion of their proven Intelligent Auto exposure mode. This user-friendly exposure program will allow anyone, regardless of their experience, to pick the G11 up and start capturing pleasing snapshots. It not only chooses the appropriate exposure values for shutter speed and aperture, but also selects the best scene settings (from 22 presets) by analyzing the picture being framed. We found during our testing that this settings was able to quickly determine the type of photograph being framed, and adjusted the cameras settings accordingly. It also did this quickly, so those who enjoy to just point-n-shoot will have no troubles at all. While this is great news, I don't want to forget about our more experienced users either. For you, the G11 offers an array of manual controls, allowing you to grasp as much of the exposure process as you can handle. These include Program AE (w/shift), Shutter Speed Priority, Aperture Priority, and Full Manual. You can also preset your favorite settings to the 2 Custom positions on the mode dial, allowing you to quickly pull up the settings used for that specific look. 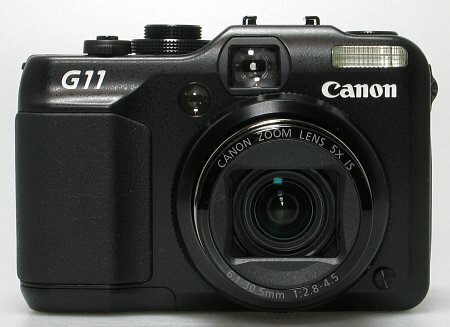 The G11's body design is almost identical to the G10, with only two changes: the new articulated 2.8-inch LCD screen and the I/O ports have been rearranged (including the addition of the HDMI output). We have come to love the design of these cameras, with their retro look and feel. For the most part, Canon did an excellent job of placing the various controls all over the G11's body. While I found all of the controls were easy to access and well labeled, I did have some issues with the Exposure Compensation dial, much like we saw on the G10 where Canon first introduced this feature. The problem is, the dial seems to move with about half the force required to move the other dials. This allowed me to accidentally adjust the exposure compensation several times, mostly when taking the camera in and out of my bag. While there is a scale that pops-up on the LCD when you change the exposure compensation value, it only displays while you are moving the dial. This means if the dial is bumped while the camera is Off, it's likely that you will have no idea until you either see the dial is not at 0, or you notice your photos are brighter or darker than they should be. The G11 offers a vari-angle, 2.8-inch LCD screen. A feature that we have missed since the G6 back in 2004, this is a very welcomed addition to this camera, offering an enormous amount of versatility over your typical fixed monitor. Like most of Canon's displays, this 2.8-inch model offers a non-glare coating that does well in most lighting. There are still a few angles that can reflect the light, however it never caused an issue with framing. Indoors the display gains up well, and thanks to its high-resolution (461k pixels), the live image does not get too grainy in marginal lighting. Canon has also updated the look of the G11's menu system, although navigation has pretty much stayed the same; which is a good thing. This new look has been carried down to the entire PowerShot line, as seen on the SX20 IS, S90, SX120 IS, SD940 IS, and SD980 IS models. As usual, menu navigation is simple, with the options logically organized and several shortcuts. Not to mention that many of the possible camera settings can be changed directly from either a button or dial on the camera body. While most might not consider the G11 a compact camera, we on the other hand do when you compare it to a super-zoom or dSLR model that offers the same level of control, and similar features. While you'll be hard pressed to stuff this camera into your pocket, it will however fit into a small handbag, pouch or purse. Another feature I liked about the G11 was the fact that you can rotate the LCD backwards (facing the camera), and close it to ensure it does not get scratched while being transported. For those who are trying to conserve battery life, or just like to frame the "old school" way, Canon has continued the option of a zoom-coupled optical viewfinder on the G11. While this is a nice option, just remember that it only shows you about 80-85% of the captures image, and because of it's position in relation to the lens, the angle of view is also off a bit; meaning the picture you capture will not look exactly as it did through the optical viewfinder. Luckily, with 10-megapixels, there's plenty of resolution for cropping. The G11 follows in the footsteps of its predecessors by offering robust shooting performance. From power up to first image captured measured about 2 seconds, which is just a bit slower than we saw with the G10. Shutter lag, the time elapsed from depressing the shutter release to capturing an image, was less than 1/10 of a second when pre-focused and only 2/10 - 3/10 of a second including autofocus. When using Auto mode, this the autofocus time slowed to about 5/10 of a second, which I presume is caused by the camera analyzing the scene. The shot to shot delay in single drive mode averaged about 2.1 seconds between frames without the use of the flash and just under 3 seconds when including the flash. You are given the choice between two continuous modes (Continuous, Continuous AF.) Using the standard continuous capture mode, I was able to capture 10 frames in 7.6 seconds (1.3fps), surpassing Canon's claim of only 1.1fps in this mode. Continuous Shooting AF mode captured 10 frames in approx. 10.8 seconds, acquiring focus for each individual shot. Thanks to the DIGIC 4 processor, the average user will rarely (if ever) run into a full buffer that will cause any type of delay while shooting. When shooting in continuous mode, the LCD briefly displays the last image captured; using the optical viewfinder during burst capture is preferred. All of our tests were done using an Eye-Fi Pro 4GB SDHC card, Program AE mode, Large Fine quality, preview On, Auto ISO, flash off, LCD on, and all other settings at default (unless otherwise noted.) Times may vary depending on lighting conditions, camera settings, media, etc. Using the G11's RAW file format gives you the flexibility to process you photo manually later on your PC or Mac. This is a great tool, and since there is also a RAW+JPEG option, you'll always have an unprocessed backup in case the original JPEG doesn't turn out quite the way you wanted it. Using RAW mode will slow the camera down, as it has to process much larger file sizes (~10MB or more each). The shot to shot delay in RAW mode ranged between 2.7 - 3.2 seconds between shots, while Continuous slowed to 10 frames in about 17.2. (0.6fps). When you install Canon's ZoomBrowser software, it includes a function called Process RAW, which brings up the Digital Photo Professional software for processing your RAW images. The G11 continues to use the versatile 5x wide view optical zoom lens we saw on the G10. With Canon's "Lens-shift" OIS technology, the G11 will be able to capture higher quality images in lower lighting conditions, compared to cameras that use sensor-shift or high ISO technologies. This lens covers an equivalent zoom range of approx. 28-140mm, with a maximum aperture of F 2.8 (W) - F 4.5 (T), which is quite fast and will further enhance your ability to capture sharp images in marginal lighting. Overall we found this lens compliments the G11's 10-megapixel sensor nicely, helping the camera capture sharp images throughout the zoom and aperture ranges. When shooting at the wide angle extreme you will notice a bit of barrel distortion, however there were only small traces of chromatic aberrations in areas of extreme contrast. The zoom mechanism offers speedy zooming with approx. 13 positions from wide angle to telephoto; more than enough for your framing needs. The G11 boasts the same 9-point autofocus system that we have seen on past models, with the same focus range as well. It covers from 1.6 ft. (50cm) to infinity in normal mode, and the macro mode covers 0.39 in. - 1.6 ft. (1 - 50cm). When using the Manual Focus option, focus is set by using the Control wheel mounted around the 4-way controller, along with the sliding bar graph with distance marks shown on the LCD. The center portion of the frame is also magnified to better determine critical focus. Overall, I found that the AF system on the G11 worked very well, even in marginal lighting thanks to the powerful "purple and white" AF-assist lamp. Image quality from the G11 was very pleasing in my opinion. When shooting outdoors, the camera consistently produced good exposures, and images are nice and sharp. I saw very little edge softness as well as very realistic colors. The intelligent Auto exposure mode did well too, and on some occasions it produced a brighter image with more vivid colors, depending on the scene settings it chose. Overall, I think the camera will produce beautiful images outdoors, whether you use Auto or Program. The zoom offers a nice wide angle of view which is nice for indoor photos as well as vast landscapes. With 5x magnification, you can bring distant objects a bit closer, but the real benefit of the telephoto end is for nice tight portraits or close-up macros. Like I mentioned earlier, the G11 boasts a new "high sensitivity" imager sensor, along with a new Low Light mode. After viewing our M&M man ISO series at 100%, I found that the G11 controls imager noise well, with a visible improvement over the G10 when compared at the same ISO settings. The G11's ISO 1600 setting matched against the G10 shows less speckling, with only a bit more softness due to noise reduction. From ISO 1600 on down, you can be confident that the images you capture will have enough detail to create nice large prints. ISO 3200 actually looks pretty good, and still has the ability to create mid sizes prints. I do want to not that the white balance is not 100% on our M&M man shots, even when using the tungsten setting. This is not the camera's fault as the lighting in my office consists of some very warm hot lamps. The Low Light mode did well, however I found it quite difficult to get the camera to use the higher ISO settings. You pretty much have to shoot in total darkness for it to choose the maximum ISO 12,800 setting, which is not a bad thing really. This shows that the camera does its best to keep the sensitivity setting as low as possible. Overall, I think the G11's new sensor performs well, producing better looking photos at higher ISO settings than past models. When shooting indoors, the G11 also performed well. The built-in flash is quite powerful for a camera of this size, and did an excellent job of lighting our indoor subjects. When combined with the intelligent Auto mode, we were able to produce some great "people" photos. You can see for yourself by looking at our couple portrait example that is on the samples page. We were shooting from only a few feet away, and the camera was able to quickly find and lock onto the girls faces, as well as change the camera settings to Portrait. If you examine the photo, you will see nice sharp facial details and accurate skin tones. If the flash it not quite powerful enough, or you just want to get the awesome affect bouncing the flash, the G11 also offers a hotshoe for external speedlites, which offers full TTL control. We were again disappointed that Canon did not included a HD movie option on the G11. The G9 at least had a 1024x768 video option, but for some reason Canon has left that feature out on their G10, and G11 models. Our indoor and outdoor video samples turned out Ok for standard VGA movies, with the average quality you see from a consumer model. With the 30fps frame rate, video is smooth, however the microphone is very sensitive and did pick up the slightest breeze on a cool fall day. Luckily the G11 does offer a Wind Filter, you just have to remember to enable it. Battery life was outstanding, as we expected since the G11 uses the same powerful Canon NB-7L 7.4v 1050 Li-ion battery pack we have seen with other models. This unit is charged in the handy CB-2LZ rapid AC charger, which features fold away prongs, making it perfect for traveling. Since the battery can be charged out of camera, we highly recommend you pick up a second pack to keep charged and ready at all times; missing a photo opt due to a dead battery can be quite aggravating. Canon claims this pack can power the G11 for up to 390 shots with the LCD on or 1000 shots while using just the optical viewfinder. While I didn't have the opportunity to capture 1000 photos, I was able to shoot over 300 still photos, several short video clips, and conclude all of our usual tests with some power to spare. Bottom line - Canon's latest generation "G" series model continues to impress us. We have long liked this line of PowerShot cameras, and although we do wish Canon would add a few things (like HD video for example), we are still very happy with the quality, performance, and feature set offered by the G11. If you are in the market for a versatile camera that offers dSLR like features, without wanting to deal with the bulk and lens swapping, the G11 might just be the ticket. With a street price of US $450 or less, the Canon PowerShot G11 offers an outstanding value, and we have no problem giving it a high recommendation.